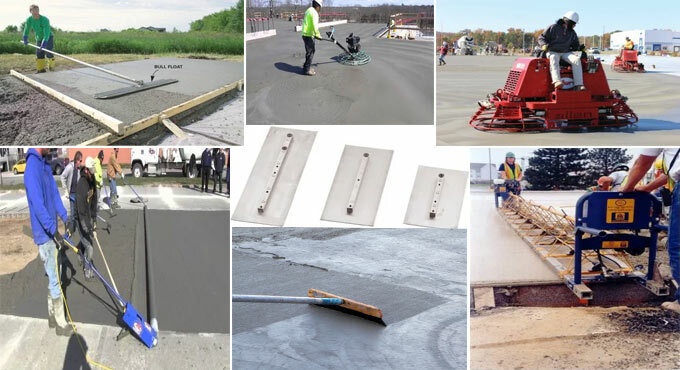 The objective of the concrete finishing equipment is to finish the concrete surface with smooth, rough, broom, texture or stipple finish while it still remains in plastic state. 1. Trowel Blade: It is a manually operated concrete finishing tool usually applied in small works like plastering works. It is generally created with wood or plastic or steel and is found in different sizes according to your need. The purpose of trowel blades is to provide a hard polished finish on the surface of concrete, whereas reduces the risk of keeping burnish marks on concrete. 2. Long Handle Float: The standard width of long handle float is 7″ and various lengths are available up to 5 feet. Its provides a smooth finish for the concrete. It is connected with a long handle for the finishing works or big concrete surfaces. It is made from high quality tempered flexible steel, the blade also features round ends prevent marking and gouging while creating a smooth surface. 3. Power Trowels: It refers to a light concrete finishing equipment that is applied for the finishing of concrete surfaces. It contains a set of trowels connected with the powerful motor, that rotates at high speed on the concrete surface providing the concrete a nice and smooth finish. It is classified into the following 2 types. 3.1 Ride-on power trowels: In ride on power trowels, operator sits on the machine and drives the machinery for smooth finishing of concrete. 3.2 Walk-behind power trowels: In walk-behind power trowels operator walks behind the machine. 4. Mechanical Tube Finisher: A mechanical tube finisher comprises of single or multiple rotating strike-off/finish tubes setting. The length of the finish tubes should be minimum of 2 ft longer as compared to the necessary width of the concrete surface to be finished. It is normally applied in the pavement finishing works. 5. Vibratory Screed Finisher: A vibratory screed finisher contains a truss frame having a minimum base width of 1 ft. It is attached with mechanical driven eccentric weights or with auxiliary driven pneumatic vibrators for executing vibratory action on the concrete. It is also mostly applied in the pavement finishing works. 6. Tining Machine: Tining is the method of creating consistent transverse grooves in the plastic concrete. It is accomplished when another layer of concrete is to be used on the surface, for making jointing perfect. Tining is accomplished with both hand tining tool or mechanical tining machine. The tining device applies a texturizing comb with steel tines placed as indicated. The grooves are arranged in the pavement to give extra skid resistance and remove hydroplaning. A hand tool with steel tines is applied and is necessary to create grooves which adhere to the same requirements as those stated for the grooves developed with the mechanical tining device. The hand device is suitable for ramps, connections, and other diversified areas where the mechanical tining device can’t be applied. 7. Concrete Edger: Edgers provide a neat rounded edge along the slab boundary to combat chipping and spalling damage once the forms are eliminated. On most floors, edging is not essential except for patios, curbs, sidewalks, and driveways. It offers a firmer, clearer looking edge that has good resistance strength against chipping. 8. Broom: A steel broom is applied to produce a rough and elegant concrete surface. It provides effects by driving the broom texture in different directions. 9. Cove Trowel: A “cove finish,” alias “mag swirl finish,” is gaining popularity for driveways and outdoor areas that require a little bit of extra traction devoid of retaining too much dirt. This trowel contains fine edge on two sides and saw shaped edges on other two sides. By applying the teeth, different patterns are produced.